An extraordinarily important book that traces America’s slide into fascism and subservience to a foreign power. 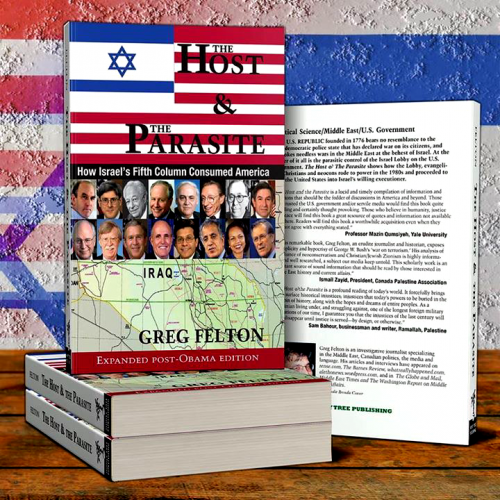 Felton argues persuasively that three groups have converged and come to dominate American policy for the benefit of Israel: the neoconservatives, the Republican evangelicals (Christian Zionists), and Jewish Zionists. He backs up his analysis with over 800 footnoted references to government, scholarly and media sources. Felton refutes the traditional progressive view that Israel is merely a client state of America. If this is so, he asks, how has America come to pursue policies that are so utterly contrary to their own national interest while being so highly beneficial to its junior partner? Felton also refutes the theory that ‘it’s all about oil,’ arguing that the First Persian Gulf War was the last American oil war and that the Second Persian Gulf War ignored the interests of American oil companies, increased American oil costs and reduced American national security. How could this have happened? The Second War, he demonstrates, can only be adequately explained by the take-over of American foreign and domestic policy for the benefit of Israel. Felton is generous in his praise of others who have explored some of this material such as John Mearsheimer, Stephen Walt, Jimmy Carter and Paul Findley. Felton’s book, however, is a far more comprehensive study of the subject and integrates a much fuller range of issues and data to demonstrate the self-destructive nature of American policy in our time. For those who imagine that America’s Mideast policy is motivated by “love of justice and democracy,” Felton reviews America’s shameful and ongoing record of supporting dictators and overthrowing democratically elected third world governments. For those who pretend that America’s Mideast policy is intended to serve America’s self-interest, Felton reviews the appalling cost to America of its pro-Israel policy: thousands of dead American soldiers; trillions of dollars of debt incurred over the years due to higher oil costs and ruinous wars; the enmity of the world; and the destruction of the American system of republican government. And what has America gained by supporting Israel? Nothing, Felton argues, that can begin to justify the appalling cost. 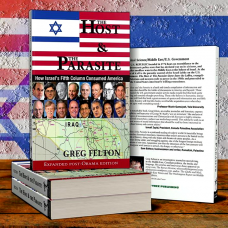 The book’s cover makes it clear that ‘Israel’s Fifth column’ includes secular neocon crooks like Rumsfeld and Cheney; Christian evangelical maniacs like Bush; and Jewish Zionist power players like Perle, Feith and Wolfowitz. Together, these people have torn up the American Constitution, dedicated America to endless war, bankrupted the country and endangered its security while cynically promoting the interests of a foreign power. This book is primarily about geopolitical skulduggery and power politics, not hidden technology. The book refers briefly to 9/11 and mentions Professor Stephen E. Jones and his theory that "thermite" may have been used to destroy the World Trade Centre Complex. I (RDH) am satisfied that Stephen E. Jones is being dis-honest with his assertion about thermite. The World Trade Centre Complex was destroyed using a directed energy weapon NOT by thermite. Professor Stephen E. Jones helped to conceal cold fusion technology (in 1989) - which is linked to the weapons technology used for 9/11. Jones has produced a mis-leading and untruthful analysis of 9/11. In my opinion he has been working for those who organised 9/11 and is part of the cover up of the secret technology that was used. Please bear this in mind if you read this book. RDH. I highly recommend the book apart from that.